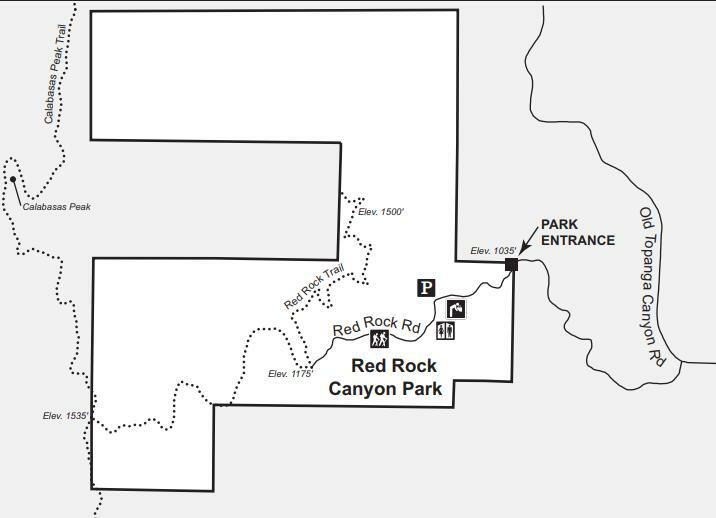 Red Rock Canyon Park is located in the heart of the Santa Monica Mountains off of Old Topanga Canyon Road. The riparian canyon walls are fortified with huge red sandstone outcroppings, reminiscent of Southwest canyons and gorges. A small picnic area and drinking fountain are available at the trailhead. The trail leads up a fire road through slopes blanketed with toyon, laurel sumac, mountain mahogany, bush sunflowers, and ceanothus to Calabassas Peak, providing spectacular views of the Santa Monica Mountains. It then descends and narrows to the cool bottom of Red Rock Canyon. The trail then meanders through fascinating sculptured rock formations in colors ranging from chalk white to deep red.